Diffuse interstellar bands (DIBs) are absorption features seen in the spectra of astronomical objects in the Milky Way and other galaxies. They are caused by the absorption of light by the interstellar medium. Circa 500 bands have now been seen, in ultraviolet, visible and infrared wavelengths. The origin of DIBs was unknown and disputed for many years, and the DIBs were long believed to be due to polycyclic aromatic hydrocarbons and other large carbon-bearing molecules. Their rapid and efficient deactivation when photoexcited accounts for their remarkable photostability and therefore possible abundance in the interstellar medium. However, no agreement of the bands could be found with laboratory measurements or with theoretical calculations until July 2015, when the group of John Maier (University of Basel) announced the unequivocal assignment of two lines for C60+, confirming a prediction made in 1987. Much astronomical work relies on the study of spectra - the light from astronomical objects dispersed using a prism or, more usually, a diffraction grating. A typical stellar spectrum will consist of a continuum, containing absorption lines, each of which is attributed to a particular atomic energy level transition in the atmosphere of the star. All astronomical objects are affected by extinction, the absorption of photons by the interstellar medium. Interstellar absorption predominantly affects the whole spectrum in a continuous way, rather than causing absorption lines, but in 1922 astronomer Mary Lea Heger first observed a number of line-like absorption features which seemed to be interstellar in origin. Their interstellar nature was shown by the fact that the strength of the observed absorption was roughly proportional to the extinction, and that in objects with widely differing radial velocities the absorption bands were not affected by Doppler shifting, implying that the absorption was not occurring in or around the object concerned. 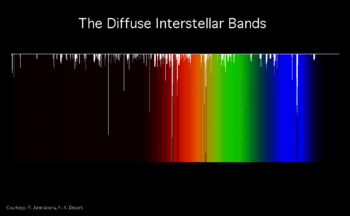 The name Diffuse Interstellar Band, or DIB for short, was coined to reflect the fact that the absorption features are much broader than the normal absorption lines seen in stellar spectra. The first DIBs observed were those at wavelengths 578.0 and 579.7 nanometres. (Visible light corresponds to a wavelength range of 400 - 700 nanometers). Other strong DIBs are seen at 628.4, 661.4 and 443.0 nm. The 443.0 nm DIB is particularly broad at about 1.2 nm across - typical intrinsic stellar absorption features are 0.1 nm or less across. Later spectroscopic studies at higher spectral resolution and sensitivity revealed more and more DIBs; a catalogue of them in 1975 contained 25 known DIBs, and a decade later the number known had more than doubled. The first detection-limited survey was published by Peter Jenniskens and Xavier Desert in 1994 (see Figure above), which led to the first conference on The Diffuse Interstellar Bands at the University of Colorado in Boulder on May 16–19, 1994. Today circa 500 have been detected. In recent years, very high resolution spectrographs on the world's most powerful telescopes have been used to observe and analyse DIBs. Spectral resolutions of 0.005 nm are now routine using instruments at observatories such as the European Southern Observatory at Cerro Paranal, Chile, and the Anglo-Australian Observatory in Australia, and at these high resolutions, many DIBs are found to contain considerable sub-structure. The great problem with DIBs, apparent from the earliest observations, was that their central wavelengths did not correspond with any known spectral lines of any ion or molecule, and so the material which was responsible for the absorption could not be identified. A large number of theories were advanced as the number of known DIBs grew, and determining the nature of the absorbing material (the 'carrier') became a crucial problem in astrophysics. One important observational result is that the strengths of most DIBs are not strongly correlated with each other. This means that there must be many carriers, rather than one carrier responsible for all DIBs. Also significant is that the strength of DIBs is broadly correlated with the interstellar extinction. Extinction is caused by interstellar dust; however, DIBs, are not likely to be caused by dust grains. The existence of sub-structure in DIBs supports the idea that they are caused by molecules. Substructure results from band heads in the rotational band contour and from isotope substitution. In a molecule containing, say, three carbon atoms, some of the carbon will be in the form of the carbon-13 isotope, so that while most molecules will contain three carbon-12 atoms, some will contain two 12C atoms and one 13C atom, much less will contain one 12C and two 13Cs, and a very small fraction will contain three 13C molecules. Each of these forms of the molecule will create an absorption line at a slightly different rest wavelength. The most likely candidate molecules for producing DIBs are thought to be large carbon-bearing molecules, which are common in the interstellar medium. Polycyclic aromatic hydrocarbons, long carbon-chain molecules such as polyynes, and fullerenes are all potentially important. After nearly 100 years since they were first observed, the Buckminsterfullerene ion, C60+, was unequivocally assigned as the carrier of two diffuse interstellar bands (DIBs). The paper by E.K. Campbell, M. Holz, D. Gerlich and J.P. Maier was published on August 16, 2015. The first prediction that C60+ was a carrier of DIBs was put forward by chemist Harry Kroto, co-discoverer of C60, and later with astronomer Mike Jura. Kroto wrote in 1988, "Starlight will ionize much of the interstellar C60 present and so C60+ should be ubiquitously distributed in space, making it a viable candidate for the carrier." 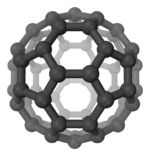 In 1987, Kroto also proposed that "The present observations indicate that C60 might survive in the general medium (probably as the ion C60+) protected by its unique ability to survive processes so drastic that most, if not all, other known molecules are destroyed." The achievement in 2015 was the result of many years of work, performed by the group of John Maier at the University of Basel, developing state of the art spectroscopic techniques to create conditions in the laboratory that simulated the extremely low temperature and low pressure of interstellar space. The critical experiment in the final phase leading up to the assignment was carried out by Maier's group which originally observed two lines of C60+ in a neon matrix at low temperature in 1993. Based on that result, B.H. Foing and P. Enhrenfreund were able to detect two strong DIBs in close proximity to the two laboratory absorption lines. However, the matrix caused shifts in the laboratory reference spectrum, and therefore, an unequivocal assignment to DIBs could not be made at that time. Maier spent the next 20 years developing the demanding state of the art techniques to permit direct comparison of laboratory results to DIBs. ↑ "The interstellar chemistry of PAH cations". Nature. 391: 259-260. doi:10.1038/34602. ↑ "The unidentified diffuse interstellar bands as evidence for large organic molecules in the interstellar medium". Spectrochimica Acta Part A: Molecular and Biomolecular Spectroscopy. 57: 615-626. doi:10.1016/S1386-1425(00)00432-7. ↑ "Ultrafast Studies on the Photophysics of Matrix-Isolated Radical Cations of Polycyclic Aromatic Hydrocarbons". The Journal of Physical Chemistry A. 108: 25–31. doi:10.1021/jp021832h. ↑ "Fluorescence of the perylene radical cation and an inaccessible D0/D1 conical intersection: An MMVB, RASSCF, and TD-DFT computational study". The Journal of Chemical Physics. 132: 044306. doi:10.1063/1.3278545. 1 2 "Laboratory confirmation of C60+ as the carrier of two diffuse interstellar bands". Nature. 523: 322. Retrieved 31 July 2015. ↑ "C60 in space and the Diffuse Interstellar Bands - History and State of the Art". Retrieved 23 August 2015. ↑ Heger, M. L. (1922). "Further study of the sodium lines in class B stars". Lick Observatory Bulletin. 10 (337): 146. Bibcode:1922LicOB..10..141H. doi:10.5479/ADS/bib/1922LicOB.10.141H. 1 2 Herbig, G. H. (1995). "The Diffuse Interstellar Bands". Annual Review of Astronomy and Astrophysics. 33: 19–73. Bibcode:1995ARA&A..33...19H. doi:10.1146/annurev.aa.33.090195.000315. ↑ Krelowski, J. (1989). "Diffuse interstellar bands - An observational review". Astronomische Nachrichten. 310 (4): 255–263. Bibcode:1989AN....310..255K. doi:10.1002/asna.2113100403. ↑ Sollerman, J.; et al. (2005). "Diffuse Interstellar Bands in NGC 1448". Astronomy and Astrophysics. 429 (2): 559–567. arXiv:astro-ph/0409340 . Bibcode:2005A&A...429..559S. doi:10.1051/0004-6361:20041465. ↑ Jenniskens, P.; Desert, F.-X. (1994). "A survey of diffuse interstellar bands (3800-8680 A)". Astronomy and Astrophysics Supplement Series. 106: 39. Bibcode:1994A&AS..106...39J. ↑ Fossey, S. J.; Crawford, I. A. (2000). "Observing with the Ultra-High-Resolution Facility at the Anglo-Australian Telescope: Structure of Diffuse Interstellar Bands". Bulletin of the American Astronomical Society. 32: 727. Bibcode:2000AAS...196.3501F. ↑ Jenniskens, P.; Desert, F. X. (1993). "Complex Structure in Two Diffuse Interstellar Bands". Astronomy and Astrophysics. 274: 465. Bibcode:1993A&A...274..465J. ↑ Galazutdinov, G.; et al. (2002). "Fine structure of profiles of weak diffuse interstellar bands". Astronomy and Astrophysics. 396 (3): 987–991. Bibcode:2002A&A...396..987G. doi:10.1051/0004-6361:20021299. ↑ Ehrenfreund, P. (1999). "The Diffuse Interstellar Bands as evidence for polyatomic molecules in the diffuse interstellar medium". Bulletin of the American Astronomical Society. 31: 880. Bibcode:1999AAS...194.4101E. ↑ "C60 in space and the diffuse interstellar bands". ↑ "Circumstellar and interstellar fullerenes and their analogues" (PDF). Astronomy and Astrophysics. 263: 275–280. Bibcode:1992A&A...263..275K. ↑ "Space, Stars, C60, and soot" (PDF). Nature. 242: 1139–1145. ↑ "Chains and Grains in Interstellar Space" (PDF). 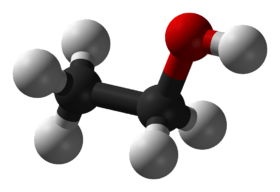 Polycyclic Aromatic Hydrocarbons and Astrophysics: 197–206. 1987. ↑ "'Buckyballs' Solve Century-Old Mystery About Interstellar Space". NPR. Retrieved 31 July 2015. ↑ "Bountiful buckyballs resolve interstellar mystery". physicsworld. Retrieved 31 July 2015. ↑ "Electronic and infrared spectra of C60+ and C60- in neon and argon matrices". Chemical Physics Letters. 211: 227–234. Bibcode:1993CPL...211..227F. doi:10.1016/0009-2614(93)85190-Y. ↑ "Detection of two interstellar absorption bands coincident with spectral features of C60+". Nature. 369: 296–298. Bibcode:1994Natur.369..296F. doi:10.1038/369296a0. ↑ "Fullerene's faint fingerprint?". Nature. 369: 274. doi:10.1038/369274a0.